Time to note creative accomplishments Week Six 2019. A group of us set intentions and accomplishments each week together in a closed Facebook group, the Go Creative! in Business group. You are invited to share your accomplishments this week there, or in the guestbook here, if you prefer. 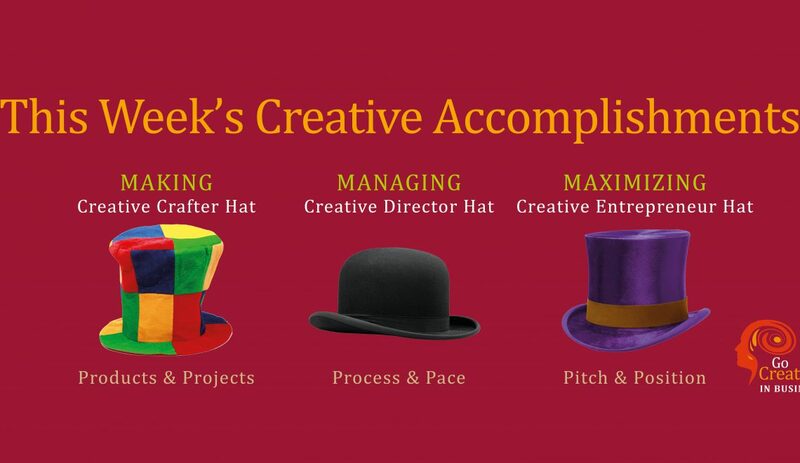 What’s unique about our group is that our report is given under the three hats a creative entrepreneur must wear: that of Maker, Manager and Maximizer. More on that in this blog post: The Successful Creative Entrepreneur’s Three Jobs. MAKER (Creative Craft): Finish Go Creative! Quarterly Planner and Start-Up Pack. Neither is quite there but almost on their way to the proofer. Likewise, I’d hoped to get two chapters of Self-Publishing for Pleasure and Profit under my belt this week, but I’m not even halfway through that one. MANAGER (Creative Direction): Working with Sacha, ALLi’s new Self-Publishing Conference manager, and our fabtabulous new tech team, to align the Self-Publishing Conference website with the other two before we move to Phase 3. (Phase 4 is “go live”). That one is going to spill into next week too. MAXIMIZER (Creative Promotion): ALLi’s Directory of Approved Self-Publishing Services is now published. And two mystery pitches dispatched. I’ll keep you posted if they come to anything. Maximizer aside, I bit off more than I could chew this week. As the point of creative planning is to fit the work to the time available, I need to go smaller next week. I’m always over-estimating and feel so much better when I don’t, when Saturday morning sees the week’s intentions completed I have a great weekend. Highlight of the week: being invited by the London Book Fair to read in its Poetry Corner. Poetry is really moving centre stage for me at the moment. Speaking of which: Our next online open mic is next Tuesday, let me know if you’d like to take part.